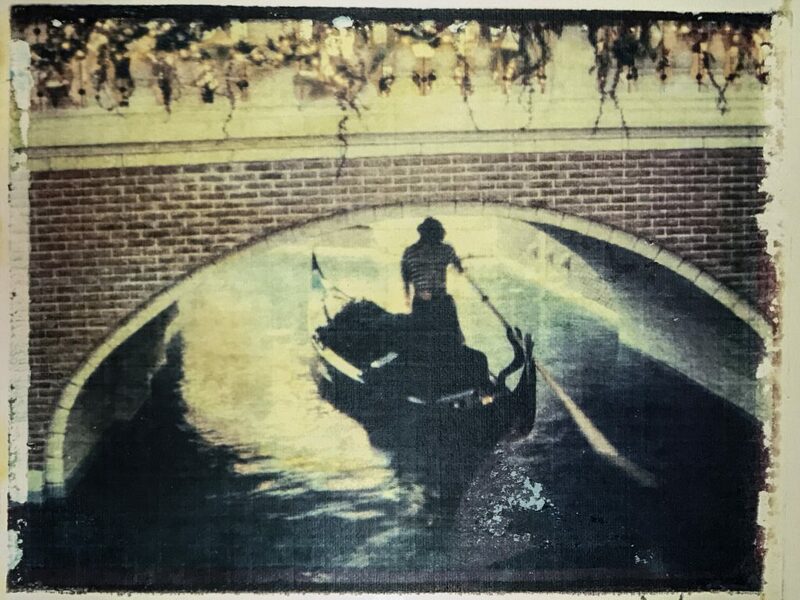 Gondolier – 13×19 inch museum quality print of a Polaroid transfer image. “The camera cannot lie!” According to The Phrase Finder website, this phrase has been around since the late 1800s. It’s unclear if it was taken as fact even then, before the age of Photoshop. I recall hearing this phrase occasionally while growing up, but its usage definitely tapered off as digital photo editing became prevalent. We now live in a time where it’s common to think “Photoshop!” any time we see a stunning image. But digital editing isn’t the only way photographs can “lie.” The entire meaning of a picture can be changed simply by cropping someone out, or taking the picture from a different angle. This image was shot on Ektachrome slide film, then exposed onto Polaroid pack film. From there, the emulsion was transferred onto linen finished printer’s paper. The entire process was 100% analog, without Photoshop or digital manipulation. This image only became digital when it was scanned for the purpose of making prints and posting online. But even though the image and process was all analog, it’s still a bit of a lie. I’ve titled it “Gondolier,” but I’ve never been to Venice. This was taken in Las Vegas at the Venetian Hotel, a building which itself is one big lie. A canal, complete with gondoliers, snakes through the main floor of the hotel/casino through a fake “Venice” and under bridges that are replicas of the the ones found in the real city. Even though I know this photo was taken in a cheesy Vegas hotel, I can’t help but feeling the pull of something exotic when I look at it. The Polaroid transfer process gives the image an aged feel and adds an abstract quality. Seeing the fake can still make me desire to see the real thing. Polaroid transfer image, shot on 35mm Ektachrome slide film, exposed onto Polaroid instant film, and transferred to linen finish printer’s stock. Available as a 13 x 19 inch museum quality print.